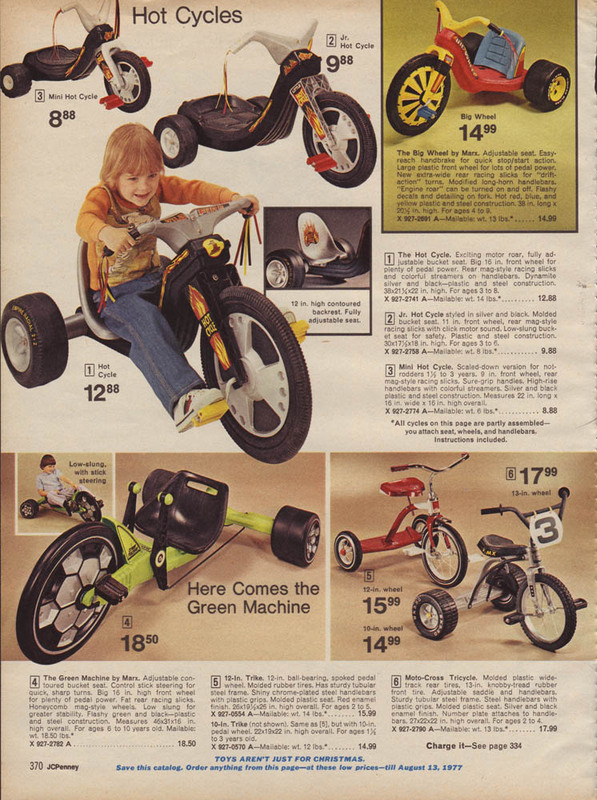 Marx Toys released the Big Wheel in 1969 and the Green Machine—“a racer for guys who like a ride that’s really fast…“—in 1976. Damn thing was the Corvette of racing trikes. 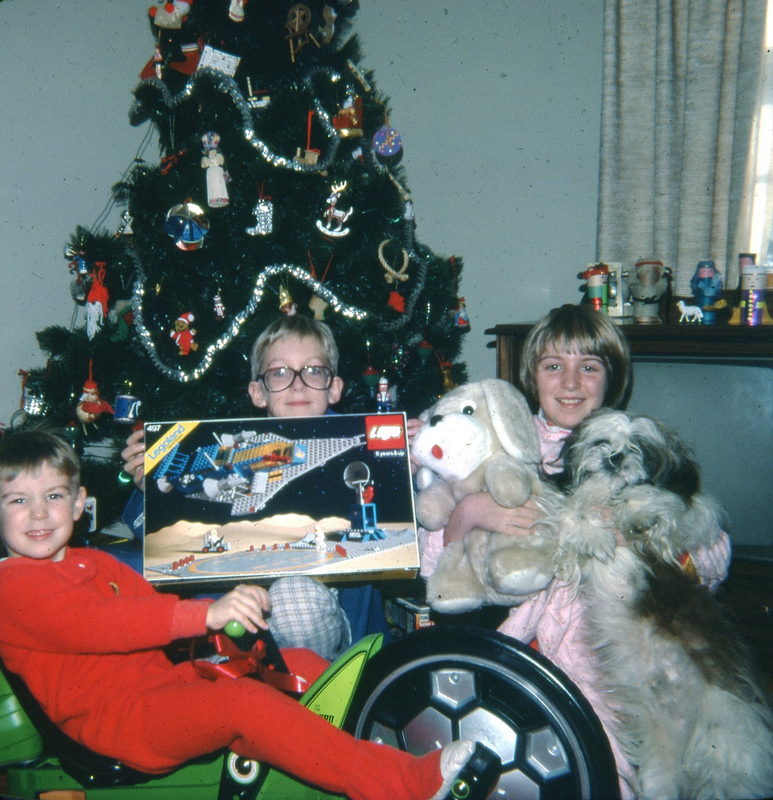 I’m assuming the dog on the left is a Christmas present, and the dog on the right isn’t. 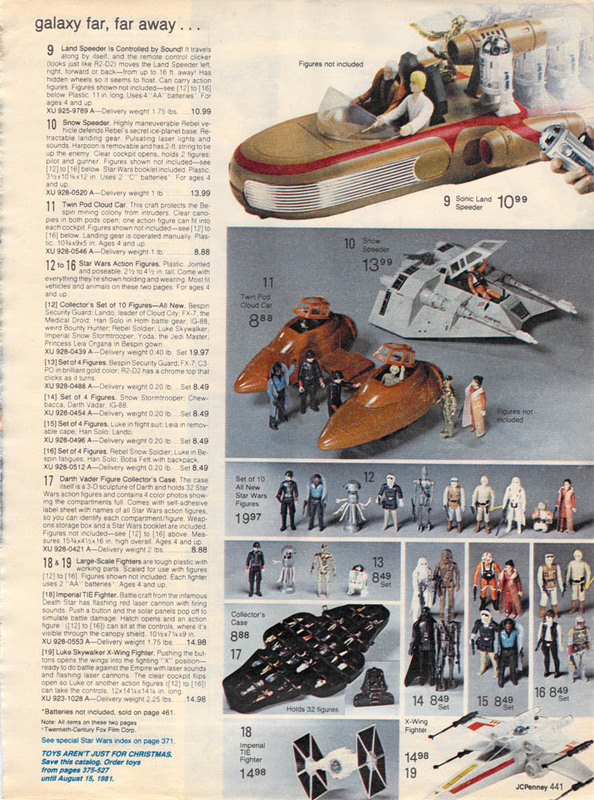 The only thing better than perusing classic toys on toy aisles during Christmastime is perusing stacks upon stacks of classic toys on toy aisles during Christmastime. 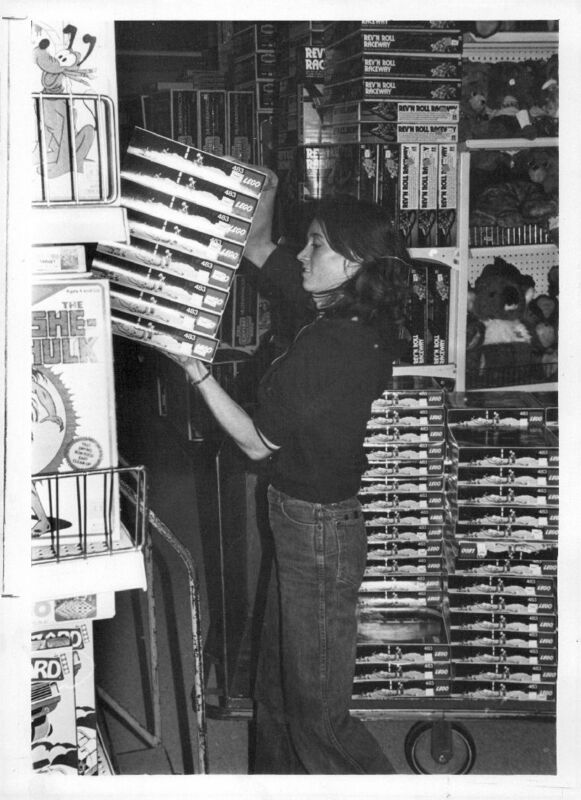 Our toy department manager is stocking the Alpha-1 Rocket Base. Behind the bundle she’s holding you can see stacks of Millenium Falcons. Top Secret was a spy vs. spy RPG released by TSR in 1980. Rubik’s Revenge was a more difficult version of the Rubik’s Cube (I so hated those cubes). 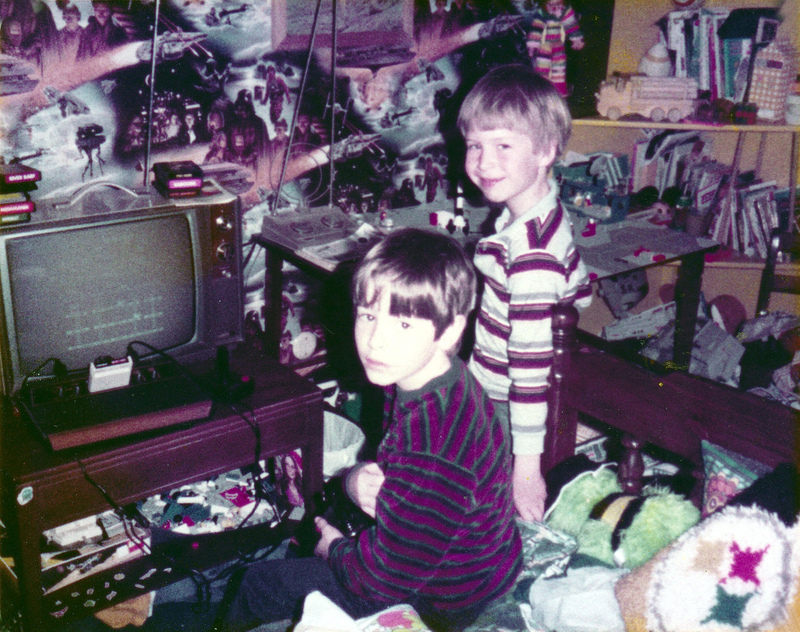 And of course that Pitfall is the original Atari 2600 version, released in 1982. Via Sam Howzit/Flickr. There’s an awful lot of awesome here. Let’s make a list. Do yourself a favor and click pic to enlarge. 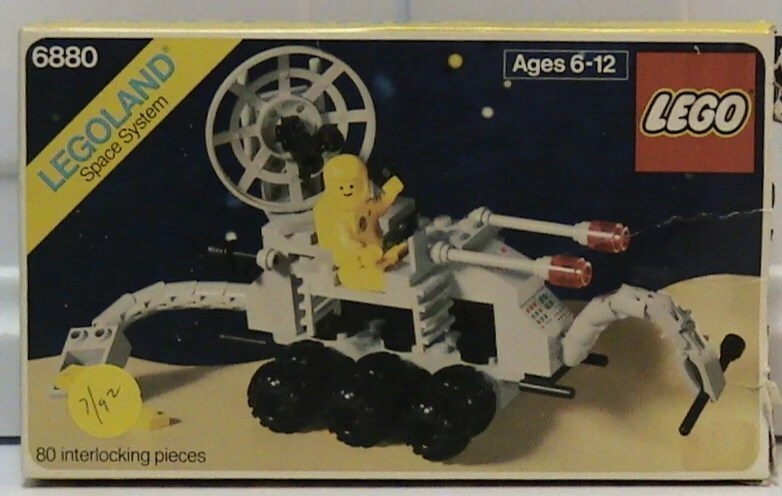 As I’ve said before, Lego Space may be the best toy line ever. Beta-1 Command Base, I would like to stroke your box. Come hither. 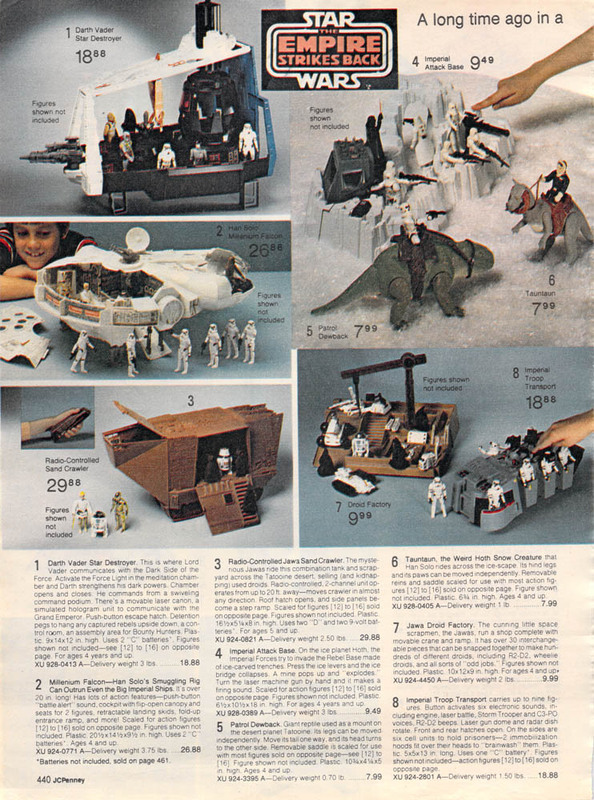 As for Empire, I had the Imperial Attack Base, the Tauntaun (subtitled “the Weird Hoth Snow Creature” in the catalog), and the Snowspeeder. I guess I opted for the all-Hoth experience. 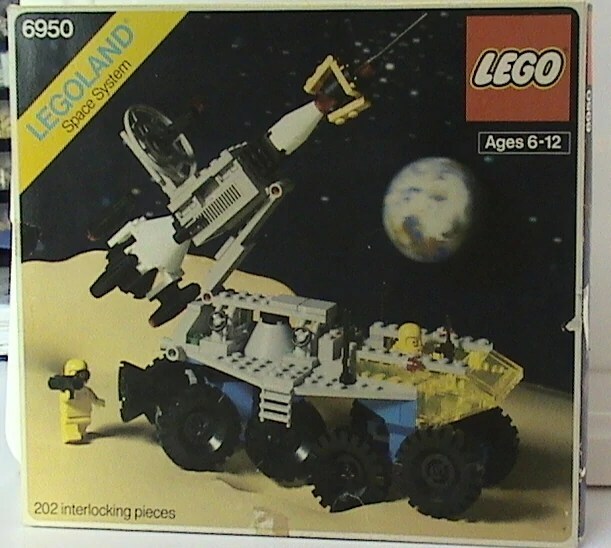 I remember hearing that the radio-controlled Sand Crawler was a flop, but I don’t think I ever saw it in action. It was way too expensive, and clearly a gimmick. 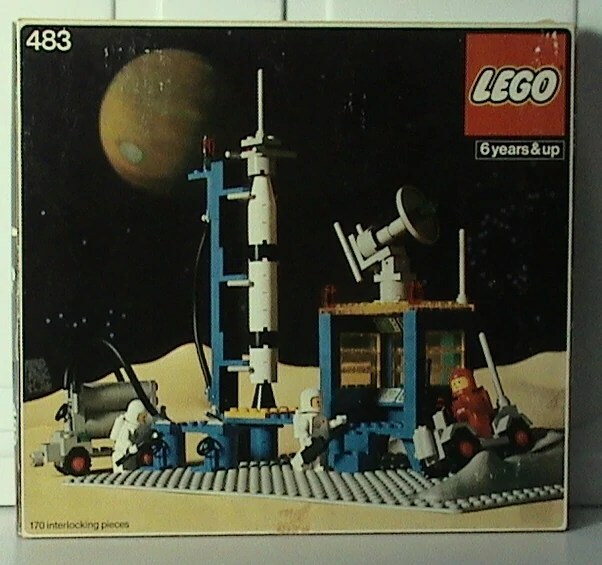 Lego may be the single greatest toy line ever produced for kids, and Lego Space, in my opinion, is the company’s greatest achievement. We essentially built our own visions of life in space. Sure, the first time through we followed the directions and built what we saw on the front of the box, but after that the Legos went into giant Tupperware containers with hundreds of other Legos, at which point we relied exclusively on imagination. 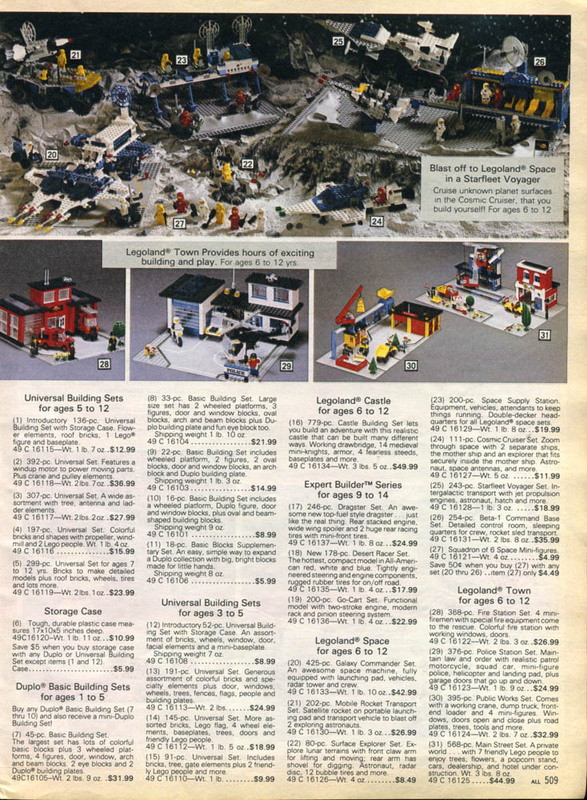 Unfortunately, Legos have always been too expensive. All the kids in my neighborhood would have to get together and combine Lego forces to produce our individual and collective masterpieces. 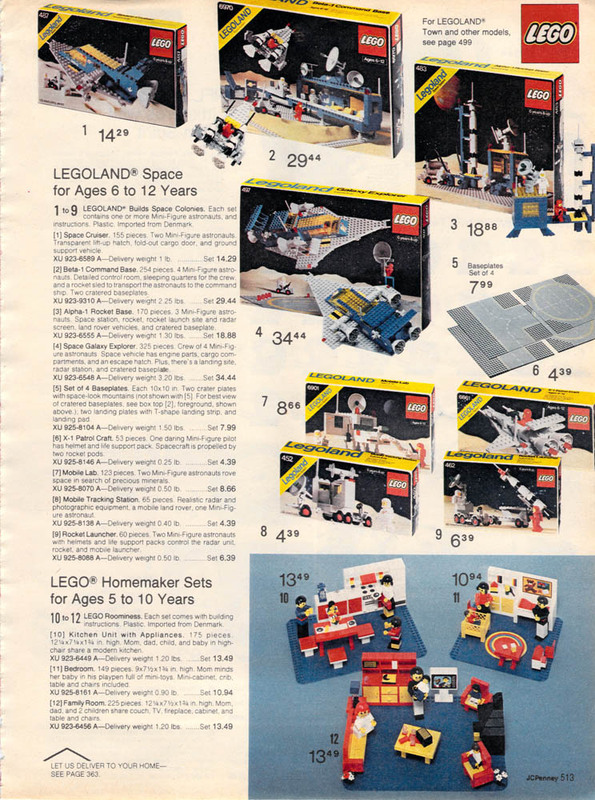 Nobody ever went home with the same Legos they brought to the table. And that was okay. I had a lot of fun playing (mostly with myself) Crossbows and Catapults, until all those goddamn caroms got lost. A hundred years from now, if the houses we grew up in are still standing, the inhabitants will still be digging these things out from the crevasses. And they would really fly, man, especially if you double-wrapped the rubber bands on the catapults. 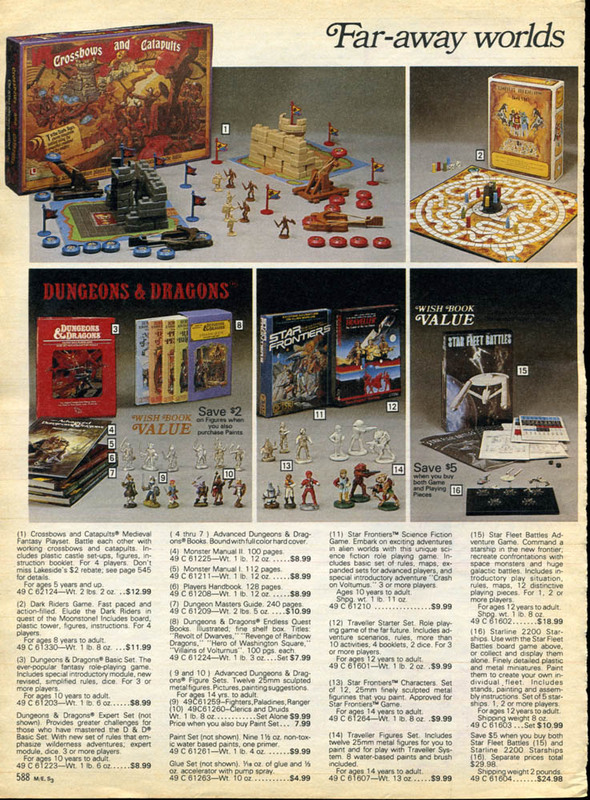 It’s funny to see all the satanic D&D stuff (notice the Endless Quest books?) in a respectable catalog. 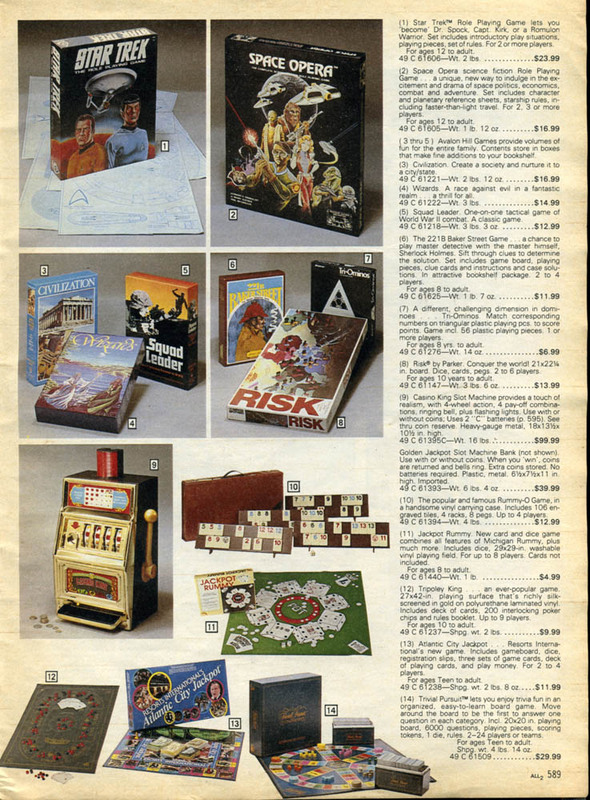 I remember seeing the Star Frontiers ads in the comics of the day, but I never had it or played it (apparently some of the old folks still play it today). 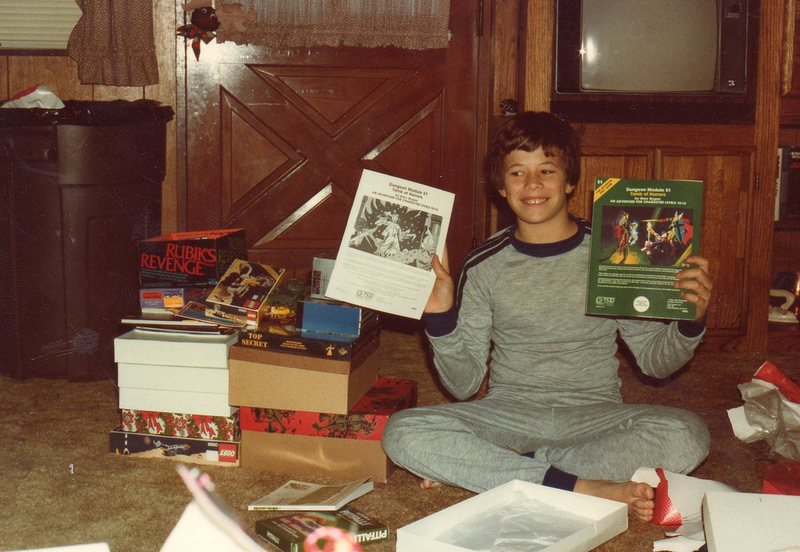 The Star Trek RPG came out in ’82, although I was too into D&D at the time to notice.